The Indira Gandhi International airport and Birmingham Airport signed an MoU to develop further links and formalise a working relationship. "CEO of Birmingham Airport Paul Kehoe and Head of Airline Marketing and Route Development of Delhi International Airport Limited (DIAL) Kiran Jain signed the MoU at the World Routes conference in Las Vegas," a DIAL statement said. The Memorandum of Understanding signifies a formal commitment by both parties to work collaboratively in order to strengthen trade and tourism links between the two cities, it said. With 36 million passengers and over half a million ton of cargo passing through IGI annually, the Delhi airport aims at becoming the leading hub of South Asia. 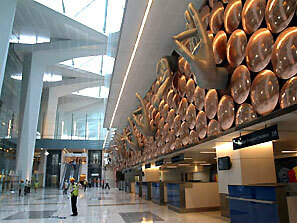 Air India had launched direct flight between Delhi and Birmingham in August with a Boeing 787 Dreamliner aircraft. "The objective of entering into a Sister Airport Agreement is to build mutually cooperative and rewarding relationships among progressive airports. We see it as a stepping stone for development of IGIAirport as an international air transport hub. It also helps expand air transport networks worldwide and will bring us sustained success," DIAL CEO I Prabhakara Rao said. Located in the heart of the UK, BirminghamAirport handles more than nine million passengers a year and is the third largest airport outside of London. "This partnership makes perfect sense because of the strong ties already in place between the Midlands and India and to continue the hard work already done to secure the route. This formal arrangement will allow us to share information and best practice to enhance links between Birmingham and Delhi and promote tourism and business opportunities at both ends of the route," Kehoe said after signing the MoU. Will PM resign? Will Rahul say sorry? YOUR say! Indian treasure worth Rs 2 crore found on frozen French peak!